The park lies in a cozy, steep-walled gorge carved by Rauchtown Run through the side of Nippenose Mountain. A northern hardwood forest blankets the bottomland along this spring-fed stream. Talus (rock) covered slopes and interesting rock formations are interspersed among a stunted oak forest growing on the steep mountainsides and ridges. This pretty valley is especially beautiful when the mountain laurel blooms during late June and the fall foliage of early October. The 215,000-acre Tiadaghton State Forest nearly surrounds Ravensburg State Park’s 78 acres. The state forest has hunting, fishing, and wildlife watching. A short drive away is Bald Eagle State Forest and the Mt. Logan and Rosecrans Bog natural areas. The park is open every day of the year, sunrise to sunset. Overnight areas are open specific seasons and hours. Day use areas close at dusk. Contact the Raymond B. Winter State Park office for facility seasons and hours. 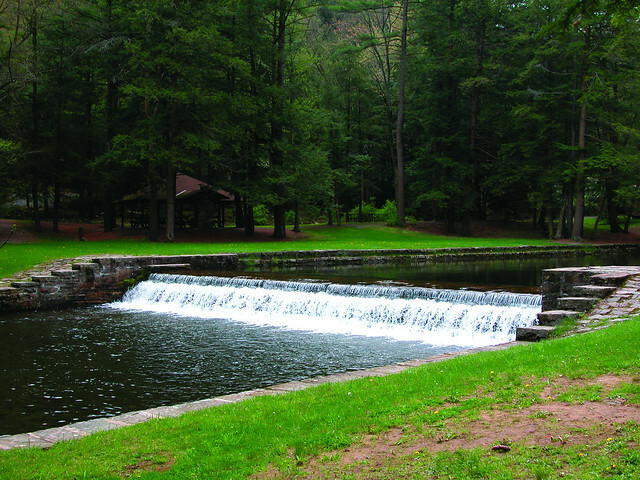 Ravensburg State Park is in central Pennsylvania, Clinton County, on PA 880, eight miles southeast of Jersey Shore, or four miles north of Carroll, Exit 192 (old Exit 28) on I-80.